As you travel north on Route 1 across the Sagadahoc Bridge in Bath, Maine, you'll look down the Kennebec River to the Georgetown "peninsula," across the river from Bath Iron Works. At the end of the bridge, in Woolwich, exit to the right, go to the bottom of the hill, and turn left onto Route 127 South, where you'll cross a series of bridges that lead to the islands of Arrowsic and Georgetown, framed by the Kennebec River on one side and the Sasanoa and Back Rivers on the other. When you cross the second bridge on Route 127 (about five miles from Woolwich), you'll be on the island of Georgetown, Maine. The island has more than 82 miles of shoreline, with sandy beaches, sheltered coves, harbors, rocky headlands, and marshes. Abundant wildlife including osprey, harbor seals, bald eagles, deer and moose share Georgetown Island with its 1,000 human inhabitants. About six-tenths of a mile after the narrow bridge connecting Arrowsic to Georgetown, you'll see Robinhood Road on your left. The road dead-ends at the Marina at beautiful Robinhood Cove, home to the Osprey Restaurant. Enjoy the great views of sailboats and powerboats cruising in and out of the cove, and enjoy fresh seafood, or savor a cocktail at the neighboring Tavern at Riggs Cove. Back on Route 127 South, you'll pass Georgetown Pottery, offering some of Maine's finest hand-painted porcelain pottery featuring Maine and nautical themes. A little farther down Route 127, you'll cross yet another bridge and head up a hill. Watch for the tiny sign on your right for the Josephine Newman Audubon Sanctuary. This park, where shoreline and woods meet, offers breathtaking views from more than two miles of hiking trails and is a great spot for birding. Several miles farther south, you'll come to Seguinland Road on the right (watch for the rock painted like an American flag), which leads to Reid State Park, an astoundingly beautiful section of Maine coast with a mile and a half of one of the finest sand beaches in the state, set against a backdrop of wild woods, sand dunes and salt marshes on one side, and powerful surf crashing against granite ledges on the other. The Seguin Island Lighthouse stands guard over this beautiful spot at the mouth of the Kennebec River. On Seguinland Road, on your way to Reid State Park, you'll pass Grey Havens Inn and The Mooring B&B, each with a stunning view. 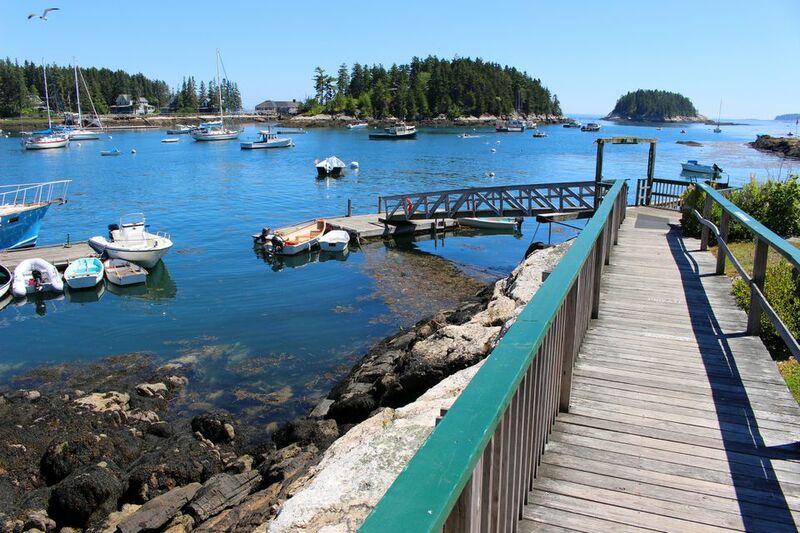 Return to Route 127, and continue south to the very end of the island of Georgetown to a beautiful harbor known as Five Islands, one of the most scenic spots in Maine and home to the Five Islands Lobster Company. On the way, stop at Five Islands Farm, a charming farm stand selling quality Maine-made gourmet specialty food products, a large selection of fine cheeses, wine and a variety of other products. Shortly after Five Islands Farm, Route 127 ends at the Five Islands wharf. Sit on the wharf next to the water, and eat fresh seafood while enjoying a quintessential Maine view of fishing and pleasure boats, summer homes and the five islands that give the village its name. Just a short distance from the harbor is Georgetown's third B&B, the Coveside at Gott's Cove. This beautifully renovated home has lush gardens, water views of the quiet cove and working lobster boats, serene rooms and inviting gathering places. If you stick to Route 1 while exploring Maine's coast, you'll miss some of the most spectacular scenery, finest restaurants and most authentic fishing villages in the state. Georgetown, just 45 minutes from Portland, offers all of this and more. Reid State Park on the Atlantic Ocean is bounded on the east by Sheepscot Bay and on the west by the Little River, and it offers both crashing surf and a calm lagoon. The wide sandy beach is enclosed on each end by dramatic rocky outcroppings. The 766-acre park actually consists of three beaches: Mile Beach, Half Mile Beach and a smaller beach near the entrance to the park. Mile Beach and Half Mile Beach both protect salt marshes, and the massive sea roses (rosa rugosa) that grow along the water's edge attract a variety of song birds. There are nature trails throughout the park, two beach houses, snack bars (in season), picnic tables, outdoor grills and a covered pavilion. The park is open all year from 9 a.m. to dusk. At the mouth of the Kennebec River lies Seguin Island, a barren hunk of rock that is home to Seguin Island Lighthouse, built in 1857. Georgetown is the nearest town to the lighthouse, but it can be seen (with binoculars) from Popham Beach in Phippsburg or, better yet, on one of the cruises offered by boating companies in Boothbay Harbor and Bath. In addition to the tower itself, the island has a keeper's house, a boathouse and a tramway that was used to transport supplies to the keeper's house perched on the top of the island. Robinhood Cove is one of the most picturesque coves in Maine and worth a visit. The Robinhood Marine Center, at the end of Robinhood Road in Georgetown, at beautiful Robinhood Cove, is mid-coast Maine's foremost yacht yard, with a full-service marina, service and repair yard and winter storage. The coolest thing you can do here? Rent and sleep aboard a houseboat. The Anchor Bar & Grill at the Osprey Nest, best known for its view, is located at the water's edge right beside the marina. Georgetown Pottery offers a wide variety of functional and decorative pottery handcrafted and hand-painted by local craftspeople and artists using the finest porcelain. This 119-acre birdlife sanctuary in Georgetown offers more than two-and-one-half miles of blazed trails through a spruce and fir forest, stands of pine and oak trees, a wildflower meadow and a marsh, in addition to coastline along the shores of Robinhood Cove. If you want to see a working harbor that epitomizes coastal Maine, follow Route 127 south until it ends at the tiny village of Five Islands. Here you can eat lunch or dinner on the wharf at the "Love Nest" grill or the Five Islands Lobster Company while watching fishermen and lobstermen unloading their catches, or rent a boat and explore the harbor, which is dotted with granite-edged islands and sleek sailboats mixed among the working fishing boats. Grey Havens Inn: A short distance down Sequinland Road on the way to Reid State Park, you'll pass the 1904 Grey Havens Inn, the last shingle-style inn on Maine's coast (open from May through October) and a popular Maine wedding venue. The inn has a soothing view from atop a hill overlooking miles of rocky coastline, islands, lighthouses, a harbor, bay and the open ocean. The Inn has deepwater anchorage, a dock and rowboats that you can use to row to an island wildlife sanctuary just offshore from the inn. Inside, the main room is dominated by a huge stone fireplace and the original 12-foot picture window made in 1904. Guest rooms are simply decorated. Some are on the small side. The Mooring Bed and Breakfast: Just down the road from Grey Havens is The Mooring B&B, the remodeled former home of Walter Reid, who donated the land for Reid State Park. The Inn offers five unique rooms, all with private baths, air conditioning and beautiful ocean views. Coveside Bed and Breakfast Inn: Coveside B&B is tucked into a secluded rocky cove across from a working lobster wharf near Five Islands. The seven guest rooms are simply but beautifully decorated in a style reminiscent of the seaside cottages of the early 20th century.